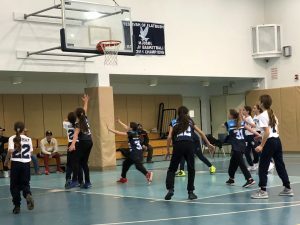 The Flatbush Falcons and North Shore Stars Middle Division Girls Basketball Teams got together on Sunday morning and afternoon (1/14) to go head-to-head in three straight games, with the 6th Grade contest going to the visiting Stars while the the Falcons were tops in the 7th and 8th Grade games at the YoF Elementary School Gym in Brooklyn, NY. 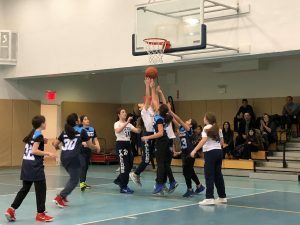 It was a busy day at the Yeshivah of Flatbush Elementary School Gymnasium, and the 6th Grade Girls kicked off the action with a spirited contest from start to finish. North Shore jumped out to an early lead, building it to 8 points, but Flatbush responded, cutting the deficit down to 4 in the second half. It was an intesely played game, and the Falcons played solid basketball throughout. In the end, North Shore was able to hold off the closing Falcons, taking the game by a score of 19-14. Head Coach Renee Dweck was very proud of the effort put forth by her girls. “They are really beginning to understand what to do on the court, not just on defense but with our offensive sets. 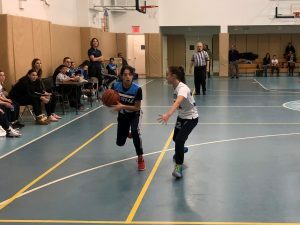 They ran our plays and shared the ball, and they are getting better with every game!” Renee Franco had 10 points, Jacqueline Romano and Marilyn Salem chipped in with 2 points each. 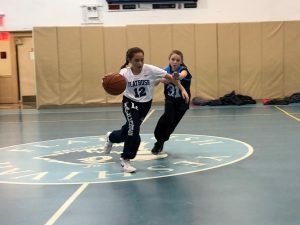 Standout defense was played by Jen Oved, and great ball handling was displayed by guard Allie Abraham. Next up were the 7th Graders. 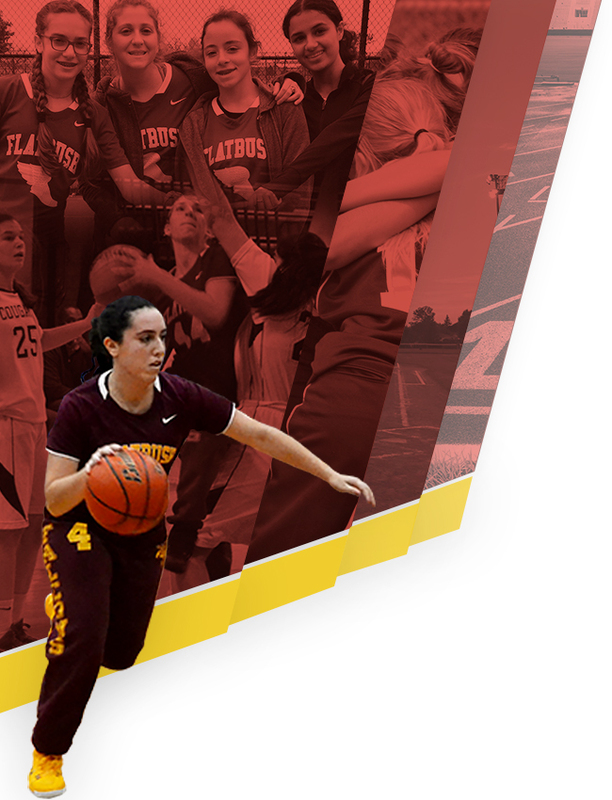 Flatbush got off to a very quick start as Danielle Frastai showed off her shooter’s touch 3 times in a row to give the Falcons a 6 point lead. The defense was incredible, but their offense was even better. regardless of who was on for Flatbush, the Falcons shared the ball, making smart and crisp passes to their teammates. That led to great shot selection, primarily by Frastai and teammate Sarah Siri, that let Flatbush build and maintain a big lead throughout the whole game. Defensively, Robyn Beyda and Linda Gindi stymied the Stars all game long, and Jamie Shamah was equally stingy in her reserve roll off the bench. North Shore began to make a run in the 3rd quarter, but the girls managed to keep it together and ultimately close out the 32-22 victory. 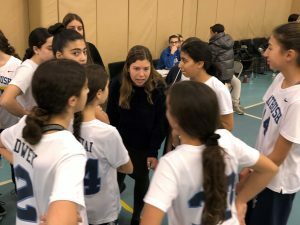 Head Coach Sylvia Franco and Assistant Coach Laurie Mizrahi were really pleased with the girls’ performance. “They’re playing exceptional,” beamed Coach Franco. 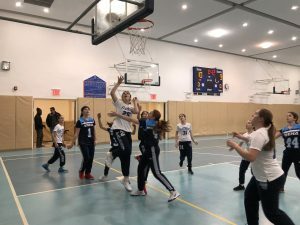 “They’re taking the skills we’ve learned together and showing us they are understanding how to really play Flatbush basketball.” Danielle Frastai led all scorers with 16 points. 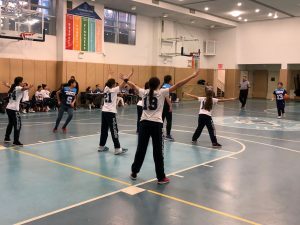 Sarah Siri scored 6 points, Linda Gindi added 5 points, Robyn Beyda and Talya Shamoelian each scored 2 points and Leah Cohen rounded out the scoring with 1 point. 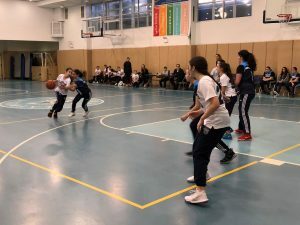 The final game of the tripleheader saw the respective 8th Graders face off. 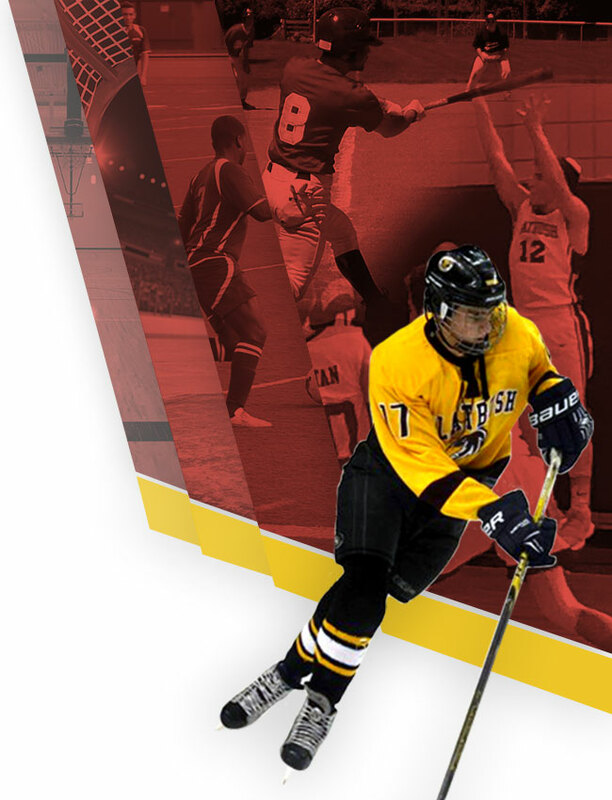 North Shore came in to the game sporting a 4-0 record, including a 2-point win over Flatbush when the teams met earlier in the season at the Great Neck school. 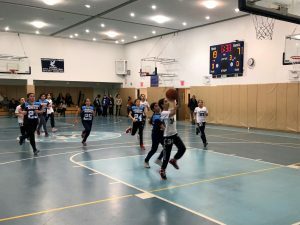 But, the Falcons have been improving as a team, as evidenced by their big road victory at Har Torah earlier in the week. 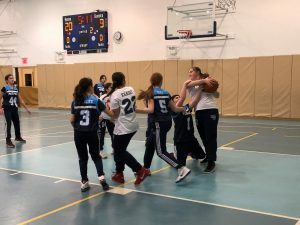 Alexa Greenstein got the Falcons on the board early, and the Falcons offense shared the ball with 7 different players scoring in the opening quarter as Head Coach Rozan Mizrahi’s squad build a 14-9 lead. 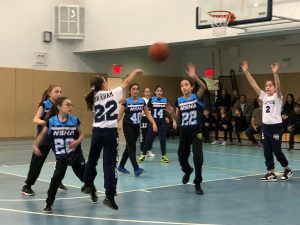 But, it was the second quarter that was pivotal, as Flatbush build a 10-point cushion on the heels of intense backcourt pressure (keyed by guard Eliana Brand) and phenomenal rebounding under the basket by the twin towers of Lynn Franco and Norma Mattout. At the half, Flatbush held a 23-13 lead. 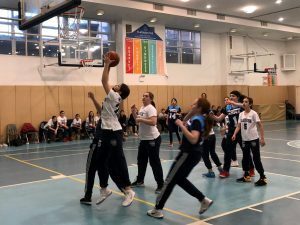 Coach Mizrahi, along with Assistant Coach Sarah Horowitz, made use of the entire roster in maintaining that lead the remainder of the game, while Mattout continued to have the hot hand all afternoon. The Falcons took home the much needed win by a final score of 35-24, handing the Stars their first loss on the season. For FlatbushNorma Mattout led all scorers with 14 points on the day. 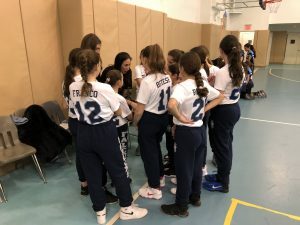 Lynn Franco added 6 points, Alexa Greenstein scored 4 points, Leah Hamui hit on a three pointer, while Nicole Levy, Eliana Brand, Victoria Angel and Ruthie Khaski each added 2 points apiece. NEST NOTES: The MD Girls will all now have some well-earned time off for Winter Break. The 6th Grade girls will get right back at it the first day back when they host SSSQ on Monday, January 29, with tip off at 6:00 pm. 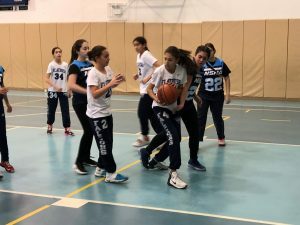 The 7th Grade girls have the longest lay off as they do not return to action until Tuesday, February 6, when they take on these same North Shore Stars in the second game of a Girls 6th/7th doubleheader at North Shore. Game time is approximately 7:30 pm. The 8th Grade Girls return to the court on Thursday, February 1, when they travel to HANC for a 7:00 pm match up with the Hurricanes.